If you haven't been along to the Civic Theatre to see the locally produced Mr Pinstripe Suit, you should book yourself in to this amazing local production that runs until October 9th. This musical is a world premiere, with an extraordinary line up of local talent. Pinstripe Suit is a new musical featuring the songs of the world’s most influential modern swing band, Big Bad Voodoo Daddy. With music and lyrics written by BBVD front man Scotty Morris and libretto by Dale Treanor, Mr Pinstripe Suit is a song and dance extravaganza set in wartime America worked around the story of an unassuming office worker who rises above setbacks such as death, selling his soul to the devil and being late for work to find courage and the girl of his dreams. 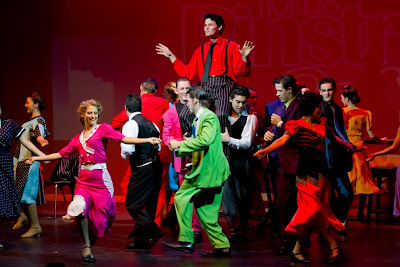 The show features 18 toe-tapping songs, a funny and endearing story line, dynamic dance routines and dazzling sets and costumes, Mr Pinstripe Suit reunites the team from Cairns Choral Society’s productions of Grease and Cats in an ambitious project. Tickets range from $17-$40, and you can book online or call 1300 855 835. This show is brilliant. Colour, movement, sound and light all included. A world class show with an all Cairns cast of great talent. Definitely a future must for Broadway. Went along to see this last Saturday - a thoroughly enjoyable night and for only $40 per head. I have paid more money to see other professional shows and enjoyed them less than this performance. Brillant - and my congratulations to a well rehearsed musical extravaganza. If you get a chance (they have put on more shows,as the others were booked out), go see it! Congratulations to the inspired writer, Dale Treanor, and all the brilliant Cairns' cast. World Class! But take it to Brisbane first as I want to take my Mum. It is fun for all ages 8 - 80. I have had my eye on this one for a while....every so often a show comes up that is locally produced, written, directed etc that everyone in Cairns is talking about. This is one of those. Bearing that in mind, here's the deal: I have three kids aged 3, 5 and 9. Is there anyone who would like to look after them one night so that I can go and see this? I promise they are not too much trouble.....except the 3 yr old, who is the cheekiest little girl you ever met...oh, and the 5 yr old, who we suspect of having ADHD....and I probably should mention that the 9 yr old has Aspergers and can be a bit tricky sometimes.....other than that though, they are easy. Promise! Seriously though, I will find a way to get there, from all reports it's a must see.